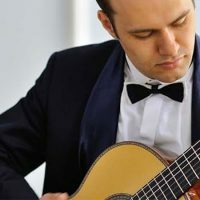 Rovshan Mamedkuliev has premiered many new works for classical guitar and performs his own arrangements. He released an arrangement of music by Russian composers (Masters of Russian Composition: Alexander Borodin and Anatoly Lyadov) and an arrangement of the music by his native Azerbaijani composer (Fikret Amirov. 6 Miniatures). A number of works are recorded by Rovshan on CDs: his first professional CD Con Anima, a guitar recital CD at the Laureate Series on the prestigious label Naxos, and a solo CD Semi-Awake, Semi-Dream on the Contrastes Records. In January of 2016 Rovshan Mamedkuliev recorded his second CD on Naxos. Expect music from multiple eras and countries and a surprise or two.